A warm escape to the ocean is closer than you think this winter season! 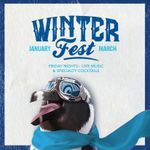 Georgia Aquarium will be hosting Winter Fest, a series of events January through March that include themed celebrations, live music and specialty cocktails, and price promotions to help guests forget about the cold outside while enjoying the wonders of the aquatic world. Daily activities include Dock of the Bay, a lively folk-style musical show to start off the day, the Waddle Walk, featuring our very own African penguins and spokespenguin, George Waddlesworth, and various shows in the 4D Funbelievable Theater. Save the date for these Winter Fest special events! Every Friday night from 5 – 8 p.m. Guests can enjoy live music and bars featuring specialty cocktails at Georgia Aquarium. Friday Nights are for the whole family, but add a little something extra to celebrate the end of the week. No separate ticket required! Saturday, Jan. 21, 11 a.m. – 2 p.m.
Each year, Georgia Aquarium celebrates Penguin Awareness Day with the annual Party with the Penguins! Join us for this FLIPPERtastic celebration to enjoy fun activities for the whole family, and also learn more about African penguins and how you can help this endangered species. This event is free with Georgia Aquarium admission. Take a 'dip' into Georgia Aquarium with your toddler, without the time or cost commitment of a General Admission ticket. Bring your little one for an interactive and educational adventure at Georgia Aquarium that includes story time, craft activity and a small snack. Each month will feature a different animal encounter and theme. February will be ‘Coral Celebration’ and March will be ‘Celebrating Green’. Friday, Feb. 3, at 7 p.m. and Friday, March, 17 at 7 p.m.
Georgia Aquarium will be celebrating Mardi Gras and St. Patrick’s Day this winter at our February and March Sips Under the Sea events. Guests 21 and up can explore the Aquarium after-hours while enjoying tapas, specialty cocktails and live music at this unique cocktail party. Tickets are on sale now! Saturday, Feb. 25, 11 a.m. – 2 p.m.
One of the most beautiful animals in the ocean, coral deserves a special celebration! Experience Caribbean culture through Carnival-inspired interactive and educational coral activities. Learn more about the foundation of many marine ecosystems and how you can help protect our ocean reefs! All activities are complimentary with General Admission or Annual Membership. Me & Mommy ticket offer is back! Receive General Admission entry for an adult and up to four children, ages 5 and under, for only $44.95 plus tax. This offer is valid Monday through Thursday until May 25. Visit before 11 a.m. and enjoy the Early Bird Discount for more than 20 percent off General Admission entry. Purchase tickets in advance online and save up to 20 percent off walk-up General Admission ticket pricing. Visit www.georgiaaquarium.org to purchase. Enjoy Georgia Aquarium by night at a special Imagination Nights ticket price! Visit the Aquarium after 4 p.m. every day of the week to save over 30 percent off full priced admission. For more information about Georgia Aquarium’s Winter Fest and to purchase tickets in advance with one of the special price promotions, visit www.georgiaaquarium.org/winterfest.